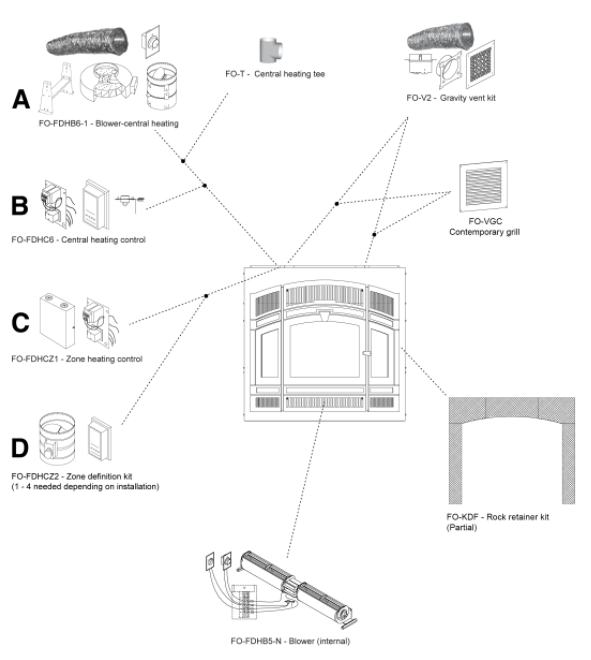 Is the Delta Fusion The Right Fireplace for You? The Delta Fusion is a semi automated system with nothing to manually control other than loading the wood. You simply fill up the fire box with dry wood and kindling, light a match, close the door and watch it burn. Regardless of your wood burning experience, you will appreciate how the Fusion automatically maintains optimal an optimal burning range on it's own. Once the Fusion has warmed up, the fireplace burns with a calm motion so that you see beautiful, slow moving flames flowing through the viewing glass. The cleanest flames are achieved with lots of secondary combustion, which happens to be when the flames are the most visually stimulating. The Fusion can't be slowed down as much as a normal EPA stove. It always burns at a medium rate, but it still burns slowly enough to enjoy a long lasting fire and lots of hot coals overnight. If controllability and extended burn times are more important to you , then we recommend the Catalytic Opel. 1.3 grams per hour air particulate matter emissions is virtually unheard of with a non-catalytic wood burning appliance and totally unheard of in a heating appliance with huge decorative fire. 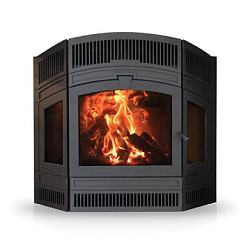 The Fusion is an environmentally friendly fireplace with it's award winning low emissions. The efficiency of the Delta Fusion is about 10% lower than other RSF, EPA certified stoves. The massive heat output, is easily capable of producing over 70 000 BTU/hr and heating upwards of 3 000 square feet. Even experienced wood burners have to learn how to adjust their stove on a regular basis depending on the weather, variations in wood quality etc. With the Delta Fusion you will get consistently beautiful, environmentally friendly fires automatically, time after time with no black glass. The NSPS requires a wood burning stove to be tested at low, medium and high burn rates and its EPA certified emissions are an average of the three burn rates. 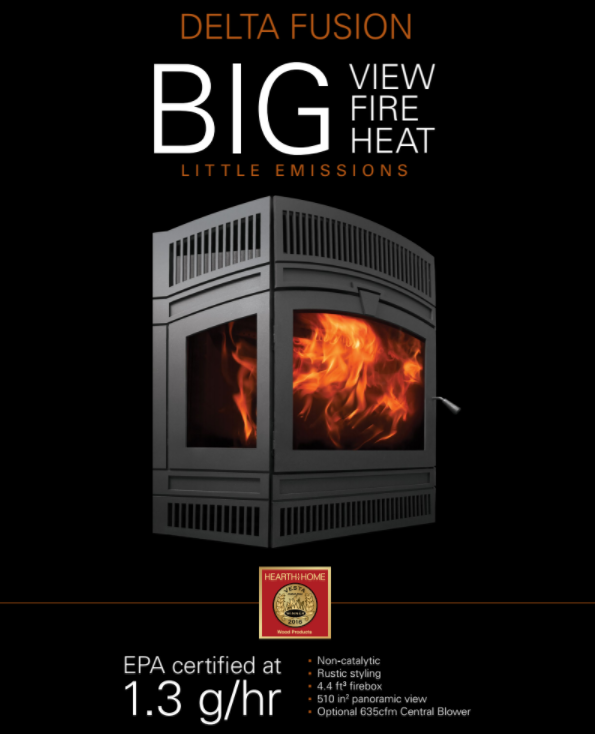 The EPA's new single burn rate stove category created the opportunity for RSF's Engineers to design a stove that would operate continuously in a "sweet spot" which produces both minimal emissions and a visually striking fire. RSF"s exclusive bimetallic air damper constantly regulates combustion air supply to keep the stove burning in the optimal range with no low and/or high burns to increase the emissions. It is vitally important for both the performance of your wood burning system as well as the safety of your family and home to have a Certified Chimney Professional install your wood burning system. 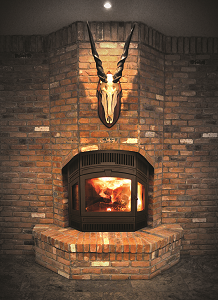 The Fusion fireplace works best when combined with ICC chimney venting products.